The late 1980s were a surprisingly productive time for Derek Jarman. In fact, the last era of his life (Jarman died in 1994) saw a wealth of creativity, opportunity and productivity that seems counter-intuitive to both the artist’s own physical health and the politics of the country he was working within. In 1986, Jarman was diagnosed with AIDS and finished his long term masterpiece, Caravaggio. From this point onwards, Jarman threw cinematic formalism to the wind; experimenting with the form to suit whatever eccentricity he wished. The subject of this article, his 1988 film The Last of England, is just one of the many gems that seemed to pour out of the filmmaker, like a confluence of angry imagination. The Last of England is not a conventional film by any means, but it does feature many of Jarman’s typical hues. From his earliest film experiments, the director had been using Super 8 to realign visual perception, going so far as to shoot at literally a handful of frames per second only. He had already began to push the medium in longer works, such as In The Shadow of The Sun (1984), and the previous year’s The Angelic Conversation (1987), but this is the first instance of the feature-length film being fully realised in this beautifully grainy medium (before being transferred to video, aptly creating further degradation). Within its disintegrating frames, Jarman unleashes his anger at the state of Thatcherite Britain; a violent, grey place verging on the totalitarian and the decrepit. The film takes its name from Ford Maddox Brown’s painting of 1855, and shares its themes of escape and the changing of place, but in the most poetic and impressionistic of senses. Whereas the characters of Brown’s painting are saying goodbye to the white cliffs of Dover, Jarman is saying goodbye in an emotional way; he’s stuck in the place physically but is witnessing a higher establishment dismantle the world around him. If Jarman were to recreate Brown’s painting, the cliffs would be crumbling. This is surmised even more succinctly in the film’s most famous promotional image of Tilda Swinton, dressed not unlike the woman from Brown’s painting, screaming and letting out a primal cry whilst debris burns around her. Swinton is the visible embodiment of a past anger that is disappointed at the present. It’s shot near the director’s home on the beach of Dungeness, Kent, yet seems completely alien and otherworldly. 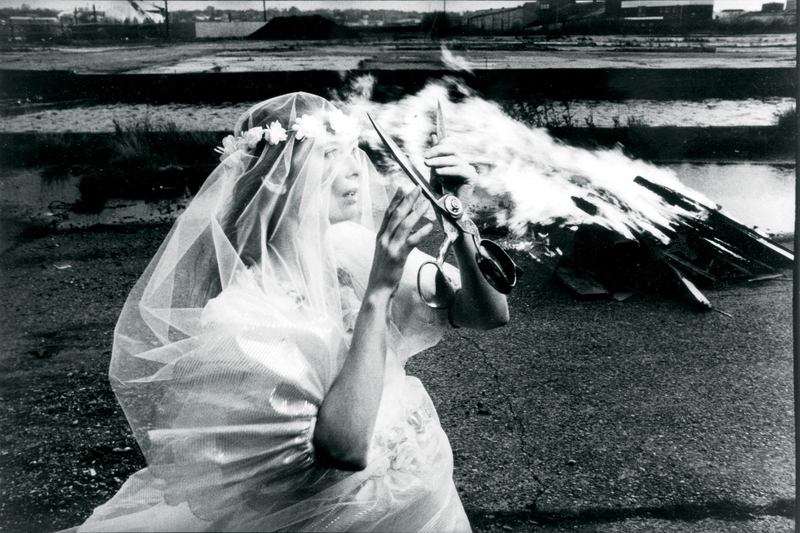 Jarman channels his anger into his work, making it either an expression of that violence or of a flamboyant disappointment with the current status quo. When Jarman was making The Last of England, the proposal for Thatcher’s Section 28 Local Government Act had been pushed through parliament just two years before (another reason why 1986 seems to be a turning point for the artist). It did not, however, come into practice until May of 1988, just a few months before the film’s release. The act, which was designed to ‘not intentionally promote homosexuality or publish material with the intention of promoting homosexuality’, must have seemed to be like the throwing down of a gauntlet to Jarman, and his anger is clear, both in his films and in his writing. Add to this the increasing lack of support and demonisation of AIDS victims, and one can garner a sense of where The Last of England’s atmosphere is rooted. Perhaps this is why Jarman’s film seems so apocalyptic and violent in retrospective. His works had often been sensuous, provocative or both (Sebastian (1976) on the one hand, Jubilee (1978) on the other), but there’s something pessimistic about England that means its blows hit harder. Perhaps the contrast between the delicate Super 8 imagery and the military violence (which looks alarmingly real at times) is what creates this sense of despair; that there’s nothing delicate and beautiful left to film (for example for stones of Avebury in 1971′s Journey To Avebury), and all that remains is the rotten crumbling walls of the Thatcherite inner city. Things would turn temporarily more optimistic for Jarman, in spite of everything that was happening in his life. Taking a look at his lavish Wilfred Owen tribute War Requiem (1989) and his subsequent music videos may give the impression of an artist settling down, getting a haircut and growing up. Yet look at the scathing attacks on the media in The Garden (1990), the corruption of power in Edward II (1991), or the hopelessness of his last film, Blue (1993), and you’ll see that the shamanistic punk was still bathed in anger at the horror of modern-day Britain; an anger that is at its purest and most hypnotic in The Last of England.